The select tool in CATIA is very easy to use and save you a huge time when you need to select multiple type of parts (points, lines, curves, etc.) because this tool can make selection by multiples criteria’s like color, type of parts, name of parts from tree and more. 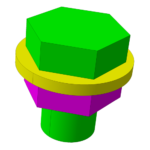 If you use CATIA for modeling parts with default Display Performance Options, I think you saw that the circle looked like a polygon, but in reality this polygon it’s a circle. This anomaly appears because CATIA must work properly on a slow computer station or into a performant Graphic Station (e.g. HP Z420).